Dr. Robert P Murphy, MD is a Doctor primarily located in Washington, DC, with other offices in Chevy Chase, MD and Fairfax, VA (and 1 other location). He has 50 years of experience. His specialties include Ophthalmology. He speaks English. The overall average patient rating of Dr. Robert P Murphy is Good. Dr. Robert P Murphy has been rated by 2 patients. From those 2 patients 0 of those left a comment along with their rating. The overall rating for Dr. Robert P Murphy is 3.0 of 5.0 stars. Following his graduation from St. Louis University with a Bachelor of Science degree in Chemistry, Dr. Murphy attended Northwestern University Medical School where he earned a Doctor of Medicine degree. His post-doctoral training went on to include an internship at Milwaukee County General Hospital, a residency in Internal Medicine at the University of California at Irvine, and a residency in Ophthalmology at Stanford University Medical Center. He then completed a fellowship at The Wilmer Eye Institute at Johns Hopkins’ Retinal Vascular Center and Vitreo-Retinal Service. He also served as a Captain in the Medical Corps following his internship. Dr. Murphy is board certified by the American Board of Ophthalmology and is licensed to practice in Maryland, Virginia and the District of Columbia. He has served on more than 20 domestic and international committees and boards and belongs to more than a dozen professional societies and organizations. A frequent contributor to the scientific body of knowledge through his own writings and reviews, Dr. Murphy has also been very active in research. He has served as a scientific journal reviewer for Archives of Ophthalmology, Ophthalmology, Retina and The American Journal of Ophthalmology, and is on the editorial board of Lasers and Light in Ophthalmology. His considerable body of work includes more than a dozen grants and contracts from organizations such as the National Institutes of Health and the American Diabetes Association. Dr. Murphy has edited three books, been published in “Letters to the Editor” in multiple scientific journals, co-authored a teaching module, produced 10 audiovisual presentations and made over 150 contributions to scientific publications. He has been honored throughout his career, having received a Senior Honor Award from the American Academy of Ophthalmology and appeared in Who’s Who in Medicine. 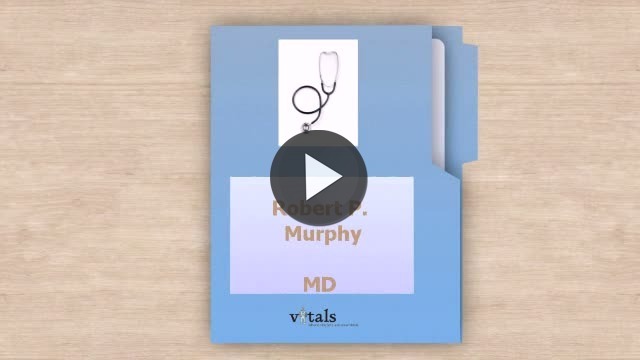 Take a minute to learn about Dr. Robert P Murphy, MD - Ophthalmology in Washington, DC, in this video. Dr. Robert P Murphy is similar to the following 4 Doctors near Washington, DC. Have you had a recent visit with Dr. Robert P Murphy? Select a star to let us know how it was.